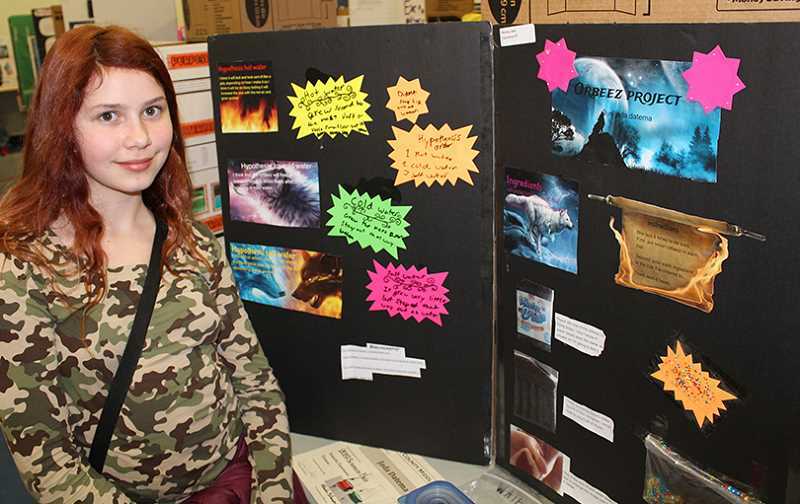 Jefferson County Middle School Science Fair helps sixth- through eighth-graders build knowledge. This year's Jefferson County Middle School Science Fair, held March 21, brought together a wide range of projects for sixth- through eighth-graders. "Science Fair is our annual event where students show their use of the scientific method in a project," said Lenida Bilanovic, sixth-grade science instructor at JCMS. "Sixth-graders do an experiment for their Science Fair project where they test something of interest and share it with others." For seventh- and eighth-graders, the project is more open-ended. "Seventh- and eighth-graders can choose if they want to do another experiment or whether they want to use their knowledge of the scientific method by building a catapult or a pinhole camera and test out what they have learned from what they have built," she said. Parents and community members turned out to check out the projects. "Students that built a catapult for their project were required to participate in the catapult competition," said Bilanovic, noting that 21 catapults were entered in this year's competition. "All of the students did a great job, whether it was a catapult, an experiment, or a pinhole camera," she said. "At JCMS, the science department really wants to encourage students to choose a project they care about and want to share with others, as well as learn from their mistakes." "Some projects were very successful; some projects were not. Science is about the learning process, not about the outcome," said Bilanovic, adding that they appreciated the support the students received from the community.